There's no two ways about it: oysters are a permanent fixture on any Valentine's Day menu, at least in any food writer's inbox in the form of a press release. Oysters are traditionally known as an aphrodisiac. Simmer oyster in liquid until plump. Drain and Save liquid. Place oyster in casserole dish - and keep warm. In a sauce pan - melt butter,add pepper and onions -add flour and water and bring to boil . 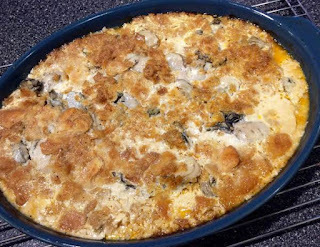 Season and pour over oysters - Top with cheese bake at 350 for about 15 minutes.